You must make reservations at least 5 minutes in advance of the time at Inn Steakhouse at Horseshoe. The parking at the resort is free. Inn Steakhouse at Horseshoe offers live music entertainment on selected occasions and weekends. Located in the Inn at Horseshoe, Inn Steakhouse at Horseshoe offers an upscale dining experience where local ingredients meet global food trends. Menus feature a range of organic, gluten free and vegetarian fare and are changed seasonally to reflect locally grown ingredients. Take in spectacular views of the ski hills while you unwind in front of the roaring fireplace with a glass from our eclectic wine selection. Had a great dinner here! Awesome service, our waitress was so nice and helpful. The food was really good. Prime rib and tenderloin both cooked just as we ordered it. Creme brûlée was perfect as well! Would definitely recommend and come back again if we are in the area. Although 2 out of our 4 meals were wonderful, the prix fix value was definitely not worth it for the caprese ravioli dish with pea soup. The child's menu pasta dish was bland and dried out. The bread with pear chardonnay butter was delicious. Otherwise, the food had a lot of merit but didn't seem to match the dollar value. It was convenient to staying in the area, a premium price is expected, appetizers and mains ranged from average to good, dessert was disappointing. We were seated next to the window and it was super cold and drafty. Food was mediocre at best. Waitress was friendly, but got she slammed and wasn't able to look at our table for a long time. I could have eaten my entire steak before my glass of wine arrived. This restaurant exceeded our expectations. To be frank, I didn't expect much since it's part of a resort. I was pleasantly surprised. The food was delicious and the service really great. Our server Jazmin was able to take our kids orders quickly and serve them in 10 minutes. This was great as they wanted to get back on the slopes for night skiing. The kids had steak and loved it. Our orders were more leisurely and delicious as well. My 8 oz prime rib was exactly as I like it and some of the best I've had at a restaurant. The sticky-toffee pudding was the perfect finish. The rest of our party had the seasonal prix fix menu which, at $48 for appetizer, main and dessert, was a decent value. The ambience is nice, but nothing exceptional. Not a cheap dinner, but for a nice evening out, worth the price. I would definitely go there again and would recommend it to anyone staying at Horseshoe Valley resort. very good food. had the beed tenderloin it was a bit lacking in flavour but still melted in your mouth. our server was amazing. i have a gluten allergy and she was very accommodating even brought me out warm gf bread! will definitely eat there again! Delicious food options in a comfortable and relaxed atmosphere. Friendly service. Service was great. The food was good the proportions where good size. The place was a bit noisy but kinda expected being family day weekend. All and was worth the price. Great meal - used the shuttle service to get there and back as well - servers were lovely and everything was timed perfectly. Relaxed and no one rushed us. Thank you. The baked potatoes were not cooked, actually hard in the middle. The steaks were very thin. Pricey for what you got. The ambience was nice and not too busy, but now I understand why. Actually we didn't actually eat any food during this visit. Being there on Valentines Day the menu had limited choices. The staff was very pleasant and understanding whe we opted to leave and walk over the the Crazy Horse Pub for a NY Steak. I was very happy that I tried it there. My meal was fantastic. Warm fresh olive bread and regular bread. Two nice butters. One had herbs. My steak was delicious and beautiful presentation. 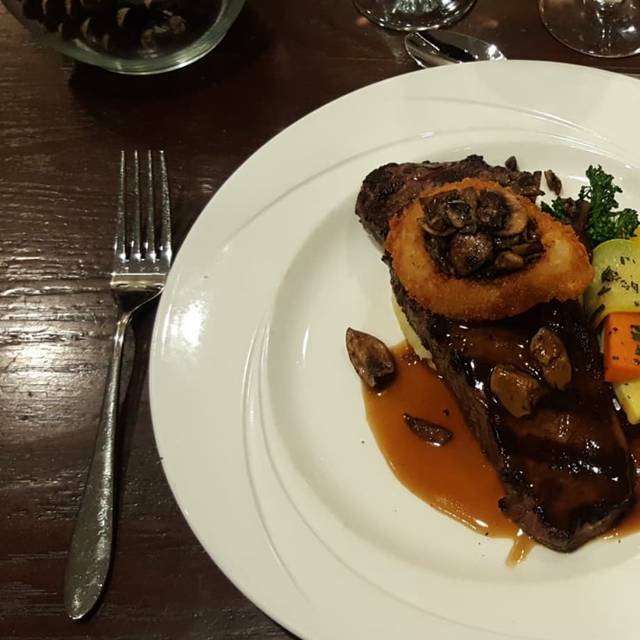 We spent our weekend at Horseshoe Resort and would definitely recommend Inn Steakhouse to everyone ! Our waitress Lindsey was extremely polite, assertive and very accommodating to our dietary needs. She went above and beyond to help make our experience wonderful. A very busy day at Horseshoe but we got a good parking spot close to the Inn. The Service, food and ambience was great. We had the Barrielicious menu. Good choice of wines. I enjoyed it very much. Beautiful location. Great value. Staff members were very professional and attentive, as well as accommodating. We could not have asked for more. We would have a meal at the restaurant in the future. Fabulous food! Great service! Good value! We look forward to a return visit! There is nothing outstanding about the Inn Steakhouse. If you go there expecting a Keg-like experience you’ll be disappointed. The food is adequate, but not great. I had a Ribeye steak that was over seasoned, and served with root fries. The meal cost $48 and if I’d paid $22 for it, I’d have said it was a good value. My expectations for a $48 steak and fries was significantly higher than what was actually on the plate. My wife had prime rib with garlic mashed potatoes and we both agreed that the root fries were the best part of either meal. The ambiance was fine. Our server was super nice. The drinks were pretty good. Service was quick. The place was nice and clean. But as far as the food goes...meh. Family ski trip. Great meal and friendly service. So great. Dined here from the Carriage Resort, very good refined food selection. Delicious, great ambiance, family friendly. The mountain view was the icing on the cake. One of the entrées we recieved had sausage on top, we eat Kosher/Halal and so they replaced it immediately. Great Service, highly recommended. The staff, from Greeter, Hostess, Busgirl to Waitress, were excellent - friendly, anticipatory, efficient and knowledgeable. The Seasonal "fixe prix" menu had very good choices and represented fair value. We were pleased with the selections, quality and presentations. The ambiance and scenery is very good here. Everything about this place was just fine. Not really worth the high end price tag though. We went to the Steak House for our 37 anniversary. From the wonderful shuttle that took us to Horseshoe and returned us home. ( wonderful driver) to the most outstanding server we have ever had!! The food was superb!! We will definitely be back! The service was slow, apologetic, food was adequate, not outstanding, atmosphere is dated. My meal was great. Steak alittle pink but good. My friends steak was very raw. The restaurant was nice but the price was not! I do not mind paying a little more for a meal that I enjoyed but I cannot say that happened. Did not enjoy the leafy greens I guess you can call it salad. There was a small amount of potatoes with the thin steak. The pecan pie tasted like it had a liquer in it which I was not fond of . The waitress was not around often to either clear our plates or bring our next meal or to even bring our check and pay.. Was disappointed overall. Had the 8oz prime beef end cut. Was like eating a filet. So tender and tasty. Would recommend it to anyone. Server was great. Food had no flavor and wine list was no good. For that price I would expect better. We have been a few times this summer for dinner and evertime it has been a pleasure! Our Servers have given us our quiet time but still very attentive of which we appreciate!!!!!! Looking forward to our next visit! The cost was a bit high for what we got, but is to be expected for a "destination resort"
Food was ok, nothing special, would expect better for a steak house. Kids menu was over priced. Server was polite. While the service was attentive, friendly and efficient, the quality of the food left much to be desired. Pre-frozen dressed baked potatoes “complemented” my $30.00 small steak, served in the sterile ambiance of “the Inn”. A disappointing stage for an otherwise fun “date night”. Wonderful staff and great food! Horseshoe Valley is a pretty setting to enjoy dinner. The lights needed to be dimmed and the country radio music was not appropriate .